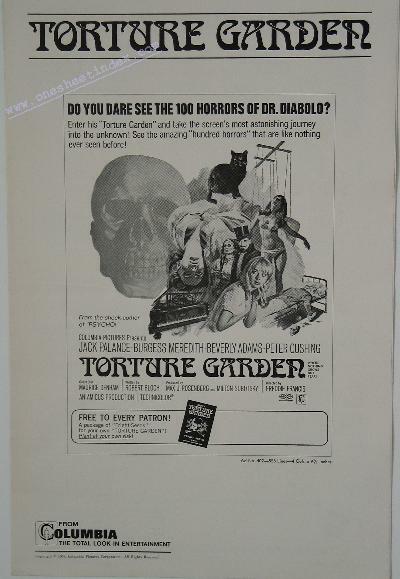 Visitors to a carnival side show are dared by the sinister Dr. Diabolo to see what is in store for them if they permit the evil in their nature to rule their lives. First to accept Diabolo's challenge is Cohn Williams, who finds that his lust for his uncle's money leads to murder. Carla Hayes is faced with the prospect of being turned into an automaton, or meeting death. Dorothy Endicott, Carla's cousin, finds her future holds the promise of a love affair with a famous pianist but the spirit of his possessive mother, using his grand piano, menaces her life. Ronald Wyatt, a collector of the works of Edgar Allan Poe, envies the superb Poe collection held by Lancelot Canning whose refusal to reveal his most treasured secret leads to violence and murder. Dr. Diabolo challenges his audience to view their own futures. Director of Photography ....................... Norman Warwick, D.S.C. Production Designer ....................... Bill Constable, F.R.S.A.